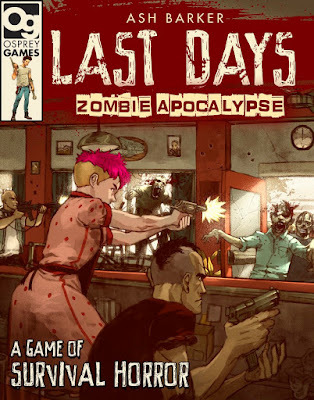 Lately Osprey has increased its menu of wargames rules with the zombie variant and published Ash Barkers' Last Days: Zombie Apocalyps. Since I am a great lover of the zombie gaming genre but good rules are few and far between I inquired after these rules, read some (positive) reviews and, encouraged, proceeded to buy and play them. This resulted in a pleasant Friday night game of about 90 minutes in excellent company. However, how did LD:ZA conduct itself? I'd like to hear what you think about the houserules. That is a very fair and honest assessment of the rules. I, too, think they are disappointing but I do like your house rules a lot. That said, it is not a game I shall be playing, especially when there are far better rules systems available. I've watched Ashesbvideos and came to the same conclusion as you on most of your points. Good review by the way. On additional rule I'd like to see is an increasing threat level the longer you are o e the table. Kind of an overall zo.be attraction score. For instance every oise counter add to the global threat level and add d6 each turn. When it reaches X increase the frequency of zombie appearance by +1. Each multiple of X increases the chance by +1. A one is always nothing, anythi g over six is multiple zombies. The idea is that the longer you hang arround, the more zombies that are attracted to the area, and the more deadly it becomes. Thanks. You will find that using the Noise counters like I described in these House rules the game will automatically produce more and more zombies until the table is overrun. You need to produce a Noise counter to shoot a zombie. You will kill the zombie one out of 6 times and will attract a new one 1 out of 2 times. So it is wired into the noise rules to produce more zombies than you kill. Unless you use silent methods only. I've been playing last days every other week since it came out with a group of friends and have enjoyed it immensely. Sure, we have made some house rules, but the game flows smoothly and the campaign system is solid. Can the Zombies be overwhelming? Its possible. But if you strategize and use the terrain to your benefit the Zombies can be minimized. Can the Zombies be overwhelming? Its possible. But if you strategize and use the terrain to your benefit the Zombies can be minimized. Actually I view overwhelming zombies as a requierment in a zombie skirmish game instead of a problem and the ease with which zombies can be minimized in this game a flaw instead of a challenge. It is clear to me that in this game the zombies are only intended to add a layer of "friction" for the warbands to overcome while facing each other. They are intended to be a hindrance and not the purpose of the campaign. In Last Days you are trying to out-build/survive your fellow survivors. It sounds like Pijie prefers surviving the zombies to be the purpose of the game. Fair enough. Different strokes for different folks. That is the difference between "The Walking Dead" and "World War Z" (novel, pity they have not made a film or a TV series based on the latter). The audiobook of the latter is well worth a listen (if you have six hours). The novel of World War Z was great. I'm not a big fan of the movie with Brad Pitt. There is no movie with Brad Pitt (any one who claims there is has been taken in by a spoof on ImDB. La la la I am not listening.....). That should explain the difference in taste. I love the WWZ novel but am bored out of my mind by TWD TV series. I see TWD as being a soap opera (corpse opera? Is that a thing? ), whereas WWZ is a documentary (mockumentary). Both are valid forms of entertainment, they just have different audience sets - there is just some overlap. I watched TWD until BT and FOX UK fell out (about halfway through series six), I binge watched the rest of series 6 and the first episode of seven (you know the one) when I had access to Sky. If it comes to Freeview or BT, I might watch later episodes - there are just other things on Sky that are more interesting and I only get access when away. FTWD is also a soap, it has just a slightly different structure (SPOILER ALERT: - the second half of series four is the best so far, as it has been almost fully recast, the characters are not deeply annoying - end spoiler). Last thought, TWD could also be viewed as Lord Of The (Corpse) Flies - what happens when humans are released from the norms and rules of their society (answer nothing good).